The black carbon fiber has a fantastic checkered layering for extra uniqueness. The contrast of the black with the beveled polished edges are just a few of the reasons this ring is so popular! This also comes in a matching 8mm band. I would like to say that this is a beautiful ring. My wife received the ring and it was too tight so I exchanged it for the next size. The ring was delivered quickly and my wife was loving the fit. She has not stopped wearing it since she got it. Best investment ever. I purchased this one for my wife and the 8mm for myself and we love them!! Even got the ring sizes right the first time.. bonus! This ring is beautiful in person. It's so smooth and rounded on the inside, it feels great on the finger and the weight is nice. I love that it's so durable. 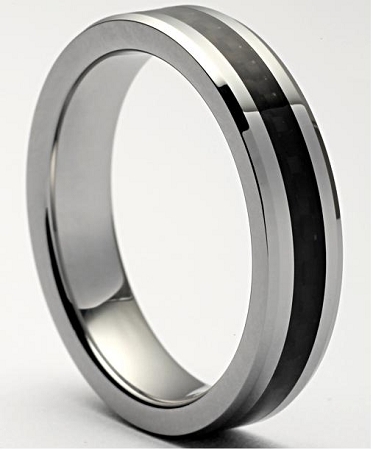 My husband has a Tungsten as his wedding band and nothing has managed to damage it, which is remarkable for my husband. Love these rings. bought this ring for my wife so we have matching bands,fabulous looking ring,great purchase,100% satisfied !!! received my new ring & very pleased with both the quality & speed of service. Fast delivery and item was as described. Awesome. We bought matching Acacia Black Tungsten Carbon Fiber rings, 5mm for my wife and 8mm for myself. We could not be happier with them. They are just simply stunning in that the black is contrasted against the tungsten so beautifully. We get tons of wonderful comments on them. We have never worn such comfortable rings. Thank you for such great rings at such resonable prices. Awesome ring! Easy to order w/quick delivery! This ring is exactly as described. It's beautifully made and fits perfectly. It shipped quickly as well. I received this ring within days! It was gorgeous! Lightweight. It was too wide for my liking so I have returned it. Hope to get a narrower replacement soon! Great ring and fast shipping. I have already used it to go out to dinner and looks great. My husband and I bought matching versions of this ring. Had to send them back exchange sizes. All went very smoothly, customer service when I had to contact them were excellent. Have had lots of compliments on the ring. Heavier than expected but comfortable. The ring is beautiful and classy. My husband absolutely loved it. Received the item quick, just perfect. International shipping came much faster than expected. I put the wrong address the first time but customer service was really nice and they corrected the problem in no time. I bought the ring for my friend and she loved it. Will buy again in the future. I am very happy with the ring, price and speed of shipping!! Would definitely recommend! !